Buy 2 pack and save over buying them separately. (2) Closed-Captioned DVDs (one Training DVD for each program) - Combine engaging video and editing technology with expertise from industry professionals. (Approximate running time 25 minutes for Vehicle Inspections, 21 minutes for Defensive Driving). (2) Trainer Tools CD-ROMs (not sold separately, one for each DVD program) - Includes PowerPoint® presentations that can be used as is or customized, along with quizzes with answer keys, clip art, and a training log. 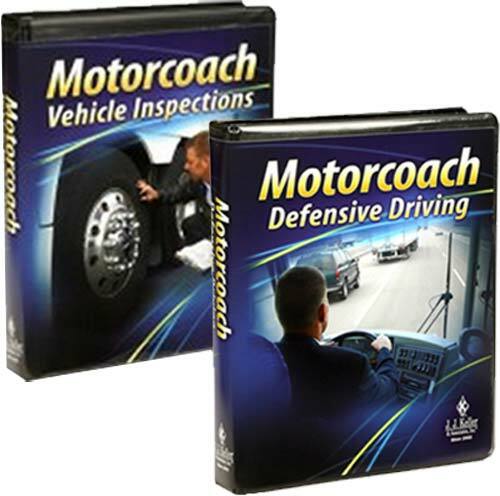 (1) Vehicle Inspections Instructor's Guide (not sold separately) - Gives helpful tips and techniques for conducting training sessions. (1) Defensive Driving Instructor's Guide (not sold separately) - Gives helpful tips and techniques for conducting training sessions. (10) Vehicle Inspections Driver's Handbook - Product Code: 26560 (502-H) - Review key points covered in the training. (10) Defensive Driving Driver's Handbook - Product Code: 26545 (506-H) - Review key points covered in the training. (1) Vehicle Inspections Awareness Poster - Product Code: 26560 (501-K -P) - Provides a visual reminder of important safety messages. (1) Defensive Driving Awareness Poster - Product Code: 26561 (502-K -P) - Provides a visual reminder of important safety messages. Commentary – Offers interviews from professional motorcoach drivers and trainers, as well as passengers. Note to Trainers – Gives introduction to the topic and the training program. For trainers and management.